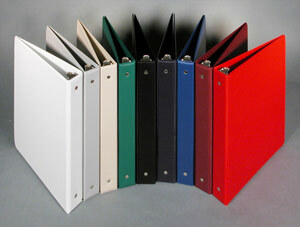 Your Printed Company Logo on Top Quality Binder Covers is Fast & Easy! Durable heat-sealed vinyl construction - 14 gage 100% suede virgin vinyl; 100 pt. board on 1-1/2” sizes and under; 125 pt. board on 2” sizes and up. Quantities of 50 - 1,000. Other quantities custom quoted upon request. Choice of 9 suede vinyl stock colors: (1101 White, 1199 Black, 1105 Royal Blue, 1120 Red, 1185 Zelda Grey, 1107 Navy Blue, 1141 Beige, 1126 Burgundy, 1163 Forest Green) Other colors are available. Please see our Vinyl Color Swatch Card. Choice of 4 round-ring sizes: ½”, 1”, 1-1/2”, 2”. Other sizes & styles available. Please see our Ring Metal Configuration. * Binders ship in 5 working days on orders received by 10:30 AM CST and is contingent upon our inspection and approval of customer furnished camera-ready art. Please read our Artwork Preparation Guidelines. Additional custom product options and quantities are available upon request and may add to the production turn-around time. Please call us to discuss your exact specifications and requirements.